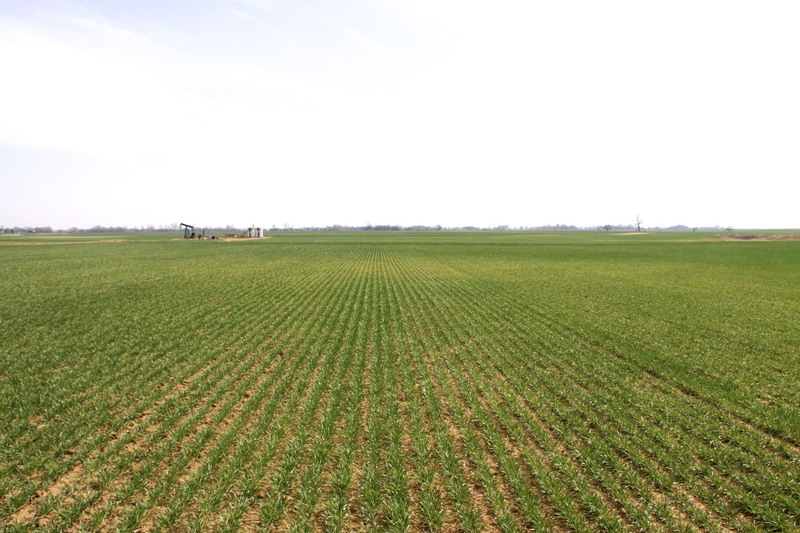 This blog post is an excerpt from the 2014 OSU Small Grains Variety Performance Tests report, which is available at http://www.wheat.okstate.edu or by clicking here. At the time of writing this post, 2014 Oklahoma wheat production is estimated to be approximately 51 million bushels, which is roughly half of 2013 production (Table 1). Oklahoma has not seen wheat production this low since the 43 million bushel crop of 1957, and with any luck, production will not be this low again for at least another 60 years. The 2013-2014 wheat production season had a good start in central Oklahoma. Topsoil moisture was short in September, but October rains resulted in favorable conditions for wheat emergence and establishment. In addition, many areas had a fair amount of stored soil moisture from the summer of 2013. This stored soil moisture allowed sites such as Chickasha and Lahoma to produce 43 and 47 bu/ac average wheat yield on less than eight inches of rainfall during the growing season. 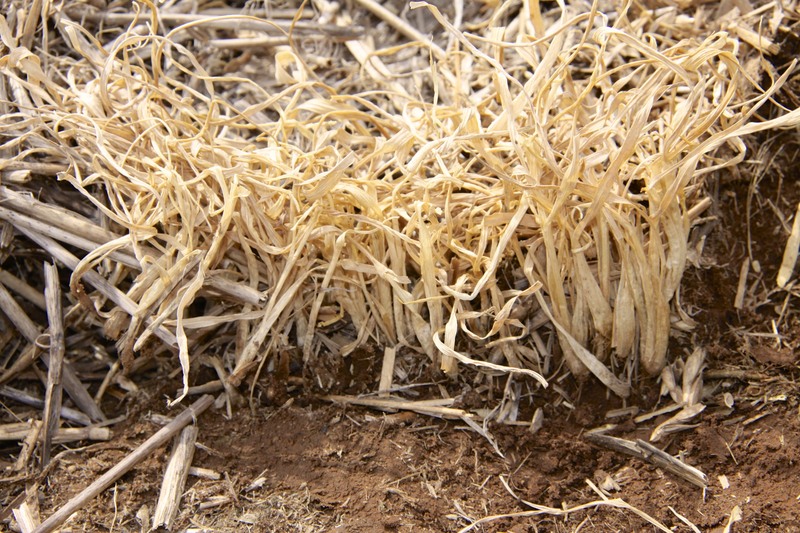 Stored soil moisture also contributed to adequate forage production at grazed sites such as Marshall Dual-Purpose, but production of a forage crop did not leave behind enough moisture to fuel much of a grain crop. The multi-year drought never released its stranglehold on western Oklahoma during the 2013-2014 wheat production season. Small rains here or there allowed most producers to obtain an acceptable stand of wheat, but moisture was never sufficient to spur tillering or leaf area development. Early winter snowfall made for a few bright spots for forage production in southwestern Oklahoma, but this moisture was quickly utilized by growing wheat plants and dry conditions soon returned. As a result, many fields in southwestern and western Oklahoma were abandoned and not taken to harvest. 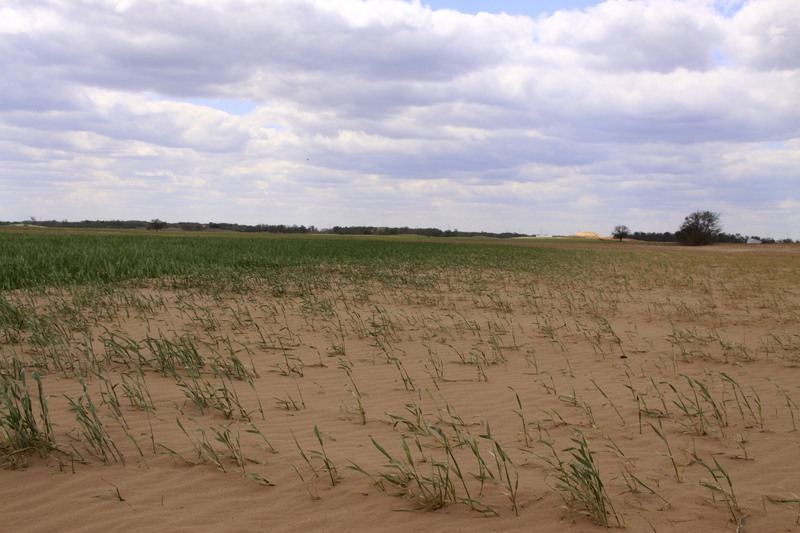 This photo of a wheat field near Altus, Oklahoma in April 2014 shows the level of devastation from the extreme, multi-year drought. Most wheat fields in this region were abandoned due to drought. The winter of 2013-2014 wasn’t just dry; it was cold too. 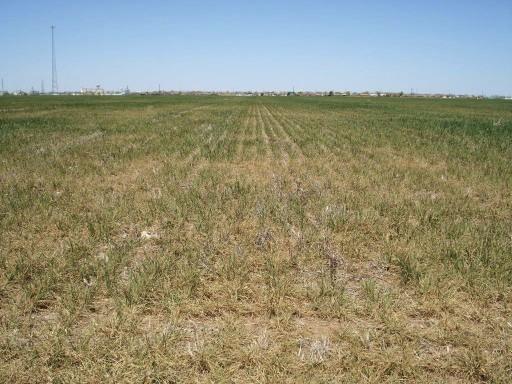 Young, drought-stressed wheat plants had difficulty dealing with the cold, windy conditions, and winterkill was common in late-sown wheat. Winterkill was also common in grazed wheat that was stressed by heavy grazing pressure and inadequate soil moisture. Considerable winterkill was also present in no-till wheat without adequate seed to soil contact in northwestern Oklahoma. The inadequate seed to soil contact was generally the result of heavy residue from the previous year’s wheat crop. 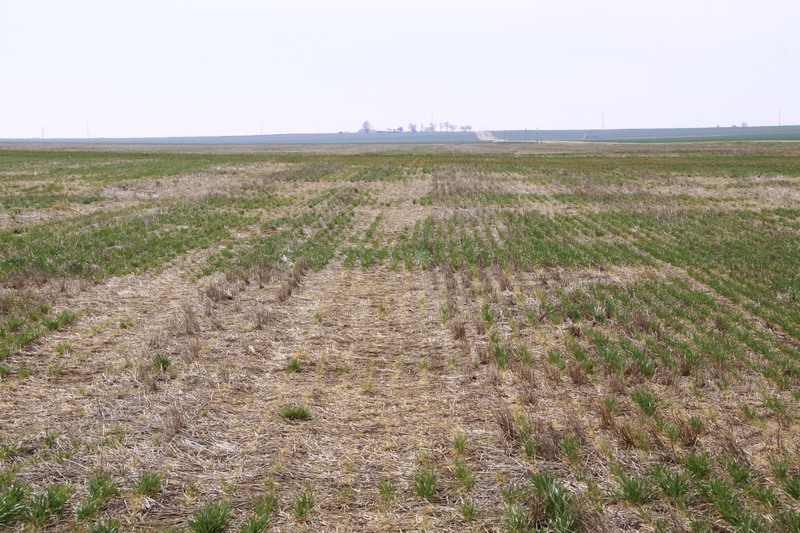 Winterkill was common in northwestern Oklahoma, with the greatest injury occurring in no-till and/or grazed wheat fields. Closer inspection of some no-till fields with winterkill revealed shallow seed placement due to heavy and/or unevenly spread residue from the 2103 wheat crop. While the wheat crop did not appear to be on its way to bumper production, most producers hoped for a turnaround similar to 2013 and topdressed in late winter. Unlike the spring of 2013, however, the rains never came and much of this topdress N applied did not make it into the soil until the crop was at boot stage or later. The cold winter delayed the onset of first hollow stem by about five days as compared to 2013 and 25 days as compared to 2012. Despite a slow start to the spring, wheat in southern Oklahoma was near heading when a hard freeze occurred the morning of April 15, 2014. As expected, drought stressed wheat in advanced stages in southwestern Oklahoma suffered severe freeze damage; however, injury from the 2014 spring freeze did not always follow the “rule of thumb” guidelines used by agronomists. Many areas that received small amounts of rain just prior to the freeze seemed to escape widespread injury, regardless of growth stage. In southcentral Oklahoma, injury seemed to be most severe on later maturing varieties that were approximately Feekes GS 7 to booting, while earlier-maturing varieties that were just starting to head escaped freeze injury. Wheat that was barely past two nodes in northern Oklahoma suffered severe injury, while more advanced wheat in central Oklahoma endured similar temperatures with minimal injury. There were relatively few insect or disease issues to deal with during the 2013-2014 wheat production season. Winter grain mite and/or brown wheat mite infestations proved to be too much for some drought stressed wheat fields in northcentral and northwestern Oklahoma. Some fields already devastated by the drought were left unsprayed, while others still showing some sign of yield potential were treated. Injury, such as the bronzed areas in the picture above, was the result of brown wheat mite and/or winter grain mite infestations in late winter. Other than a rare siting of a single leaf rust pustule, there was no foliar disease in Oklahoma in 2014. The lack of foliar disease is evidenced by the lack of response to foliar fungicides at either Chickasha or Lahoma. These two sites provided a rare opportunity in 2014 to observe yield impacts of foliar fungicides in the absence of disease, as most years we report at least light or negligible foliar disease at these sites. While foliar disease was not an issue in 2014, wheat streak mosaic virus was an issue for many producers. This disease has historically been most prevalent in northwestern Oklahoma and the Panhandle. Wheat streak mosaic virus was confirmed in several fields downstate this year, however, and it is likely that some fields affected by wheat streak mosaic virus were not identified as such because it is sometimes difficult to distinguish wheat streak mosaic virus symptoms from those of severe drought stress. The wheat variety testing program was not immune from this disease, and we lost our Kildare location to wheat streak mosaic virus. Warmer temperatures in May hastened crop maturity and the Oklahoma wheat harvest began near Frederick on May 22, 2014. By the first week of June, harvest was in full swing, only to be delayed by rain shortly thereafter. Harvest resumed across most of the state by June 13 and was mostly completed by June 30. The exceptions being some waterlogged areas in northern Oklahoma. The Cherokee Mesonet site, for example, reported 5.1 inches of rainfall from October 1, 2013 to May 31, 2014, but the same site received 10 inches of rain from June 1 to June 30, 2014. By osuwheat in variety testing, wheat on July 15, 2014 .